Transplant surgeon Dr. Joshua Hermson (L) and Carrie Kirkpatrick hold a drawing done by Carrie’s late husband Scott. An exhibit of Scott’s work will hang in the UW-Health Art Gallery this month. Scott received a heart transplant at the faciity in 2017. 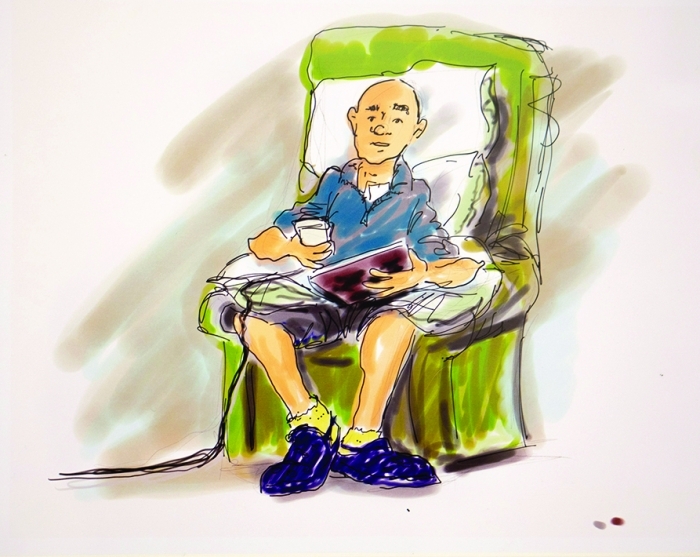 MADISON–Middleton resident, adman and illustrator, Scott Kirkpatrick scheduled an exhibit for his drawings at the UW-Health Gallery last year. Now, six months after his death, the exhibit has come to fruition. The gallery wall, coincidentally, is right outside the transplant center at the facility, an area Scott knew well because after a heart attack that cause a car crash in 2017, Scott was in need a of a new heart. A heart was found relatively quickly, and Scott was on the road to recovery when he drowned in a separate car accident in August of 2018 after he and wife Carrie Kirkpartick accidentally drove off the Merrimac Ferry landing. She added that at first, they thought they were in a lake, then the car began to sink. When Carrie was finally able to get the passenger window open, Scott told her to go first. “He was always a very fierce protector,” she said. Scott death was a shock to everyone, including Dr. Joshua Hermson, the transplant surgeon who conducted Scott’s surgery. He said Scott’s recovery was on track, and he expected him to live 20 years with the new heart. 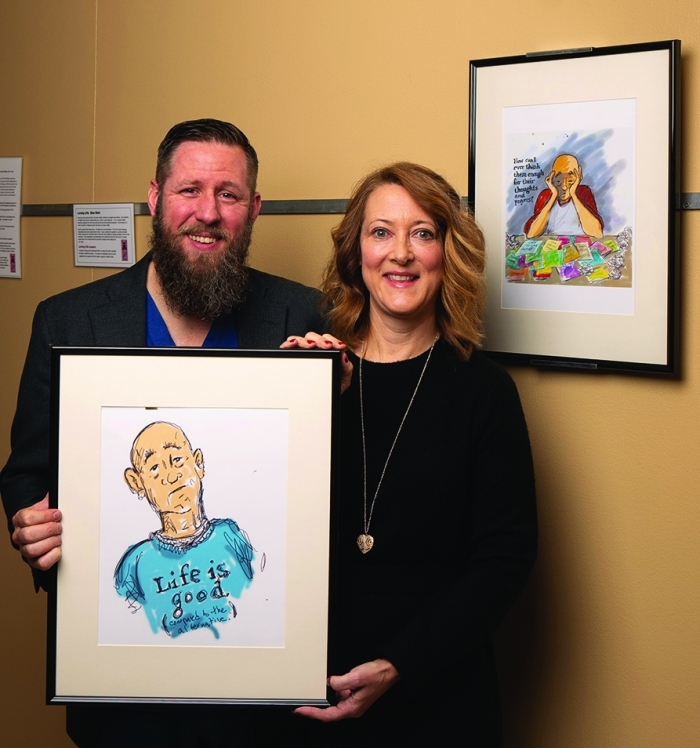 Dr. Hermson and Carrie both said that drawing was Scott’s outlet and a way to deal with all the emotions that transplant patients go through. 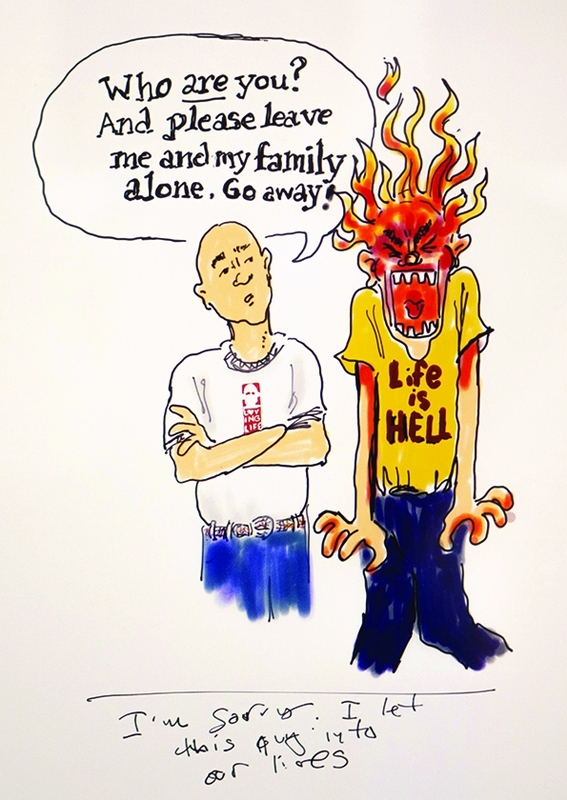 They both hope that his drawings can help other patients deal with these feelings. “It’s really hard for patients to express that–what’s going on in your head,” Dr. Hermson said. “We contact the artist before we schedule a couple months before the show, and I found out Scott had passed away from his wife. She decided to go ahead with the exhibit,” said Mandy Kron art coordinator for UW-Health. Unfortunately, Scott’s laptop, phone and tablet (his favorite drawing device) were all in the car when it sank in the river. Scott had sent emails of some pieces to Mandy to review, and between Mandy and Carrie, they were able to come up with 16 pieces for the show. One is a logo Scott created with a silhouette of a bald man (Scott was bald) and the words “Loving Life” that he created to use on t-shirts for the Crazy Legs Run. The drawings also include descriptions of what Scott was going through at the time and inspirational messages. “It’s really the combination of Scott’s art, the descriptions and messages that make it powerful,” she said. “It’s also not just one flavor or emotion,” Carrie explained of the preparation for the exhibit. “It was hard because I really had to spend a lot of time thinking about what Scott was feeling. I just relived it,” Carrie said. Most of the sketches were done at the hospital on a tablet, and Scott would sometimes draw pictures of the staff at the hospital. “After we got a heart for him, he did a little sketch of me that got lost on his laptop,” Dr. Hermson lamented. The exhibit is up now and runs through Feb. 26, with an opening reception from 5-7 p.m. on Feb. 8. The art is housed in the Town Center in the clinics lobby at UW-Health.